Kabylie, or Kabylia, is a cultural and geographic region in Algeria between the Tell Atlas mountains and the Mediterranean Sea. It is home to the Kabyle people, a Berber ethnic group who speak Tamazight as opposed to most of the rest of Algeria, who speak Arabic as their primary language and are of Arab-Berber descent. Kabylia was part of the Roman Empire , but was difficult to take when the Ottoman Empire swept through North Africa due to it’s geography high in the Tell Atlas Mountains. It was one of the last strongholds in Algeria that held against French colonisation, although gradually the area fell and much of the land was given to French Europeans born in Algeria for farming. Since independence from France, there has been tension between Kabylian authorities and the central government. 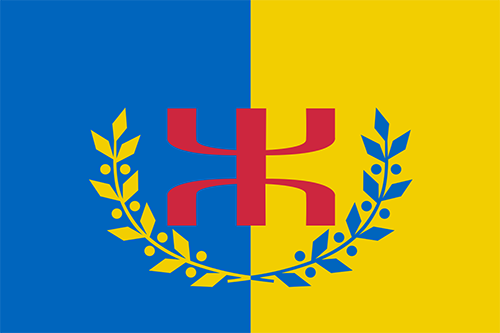 The largely socialist leaders in Kabylie opposed the single-party system imposed on Algeria from the capital, leading to two years of armed confrontation in the area in the 1960s, resulting in the execution or exile of most Kabyle leaders and the deaths of hundreds of people. Throughout the rest of the 20th Century there were crackdowns on events celebrating traditional Kabyle culture, calling them ‘regionalist’ and saying they were a threat to National Unity. All education was legally required to be in Arabic. This hard-line Arabisation had the opposite effect, and led to Kabyle people finding a sense of identity within their own culture more than before. In April 2001, Massinissa Guermah, an 18-year-old Kabyle high-school student was killed in mirky circumstances in police custody, leading to widespread riots in Kabylie which left 123 dead and many more wounded. Eventually, Algerian and Kabylian authorities came together to discuss social justice. Tamazight was recognised as a ‘national language’ in 2002, and became an official language of Algeria alongside Arabic in 2016. The Algerian government’s intolerance of anything that’s a threat to national unity has led to an intolerance of the Kabylie National Football Team. When Aksel Bellabaci, the president of the Kabylie FA, tried to hold a public talk about the team in his home village, the Algerian police broke the meeting up and tried to arrest him. Most of the activities of the Kabylie National Football team take place in France instead of Algeria. This will be the first tournament that Kabylie will take part in. They have had a positive run up to the tournament, claiming to have played 11 and won 11 on their website – although I think that stat is ignoring some of the games they lost. They were only practice games, perhaps.